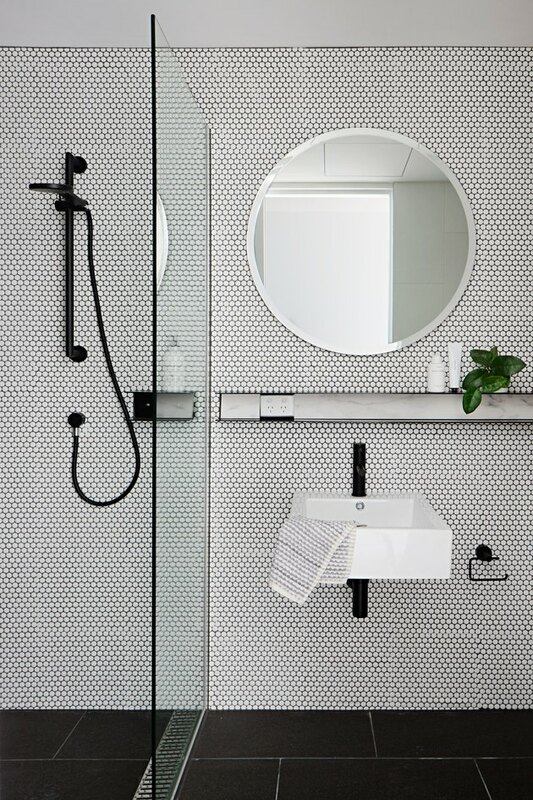 Contemporary bathrooms are all about modern fittings paired with timeless materials and finishes. Think clean lines and innovative designs that are seemingly fit for a photoshoot even when they're a little less than tidy. Sound too good to be true? Think again. If you're planning a revamp for your personal sanctuary, take note of these 13 contemporary bathroom ideas that are turning heads. This bathroom by 2LG Studio incorporates a bold use of color, a clash of pattern, and sculptural forms via the twin vessel sinks and spherical lighting. 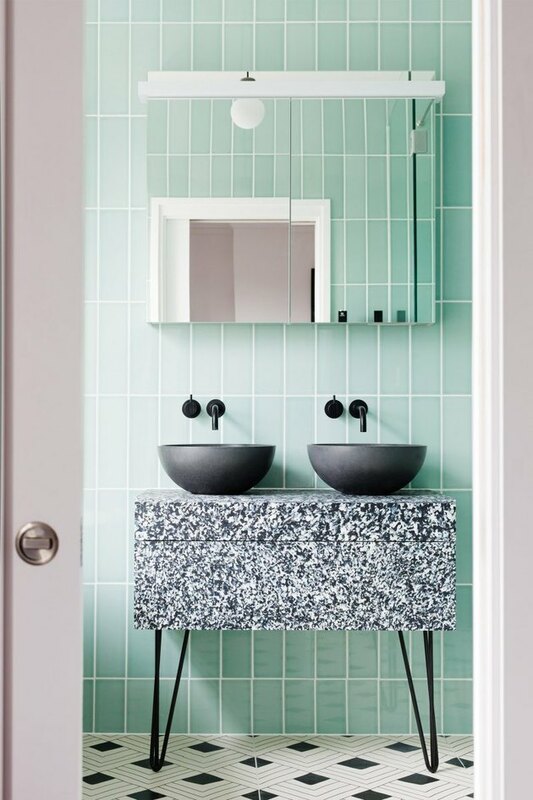 Hairpin legs finish off the monochrome terrazzo-like vanity. Why make do with only one sink in your bathroom, when you can have two? This handsome symmetrical setup designed by Jean Charles Tomas would surely make getting ready in the morning a breeze. We especially love the custom wood vanity cabinet with vertical slats complemented by a rich marble countertop and black fixtures. 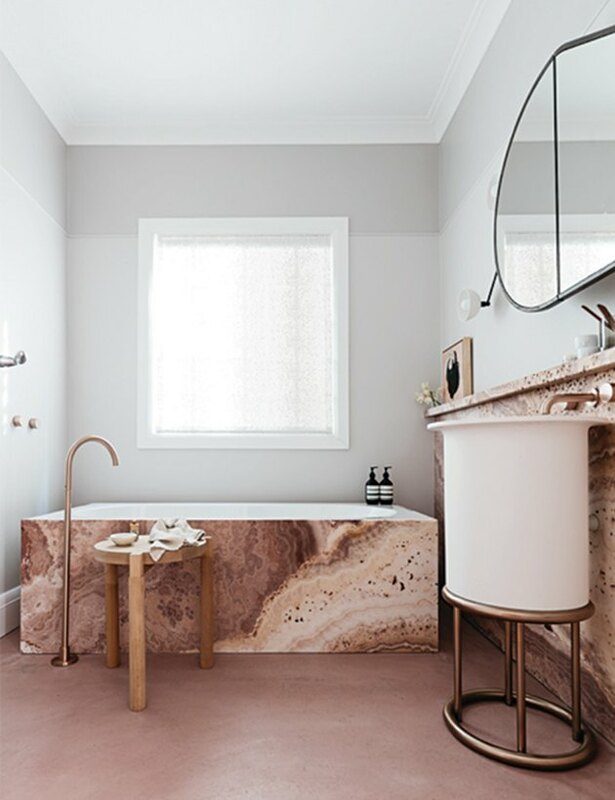 Soft plaster finishes are all the rage right now, and this contemporary bathroom by Rose Uniacke is hitting all the right notes with its ballet slipper color and subtle natural textures. 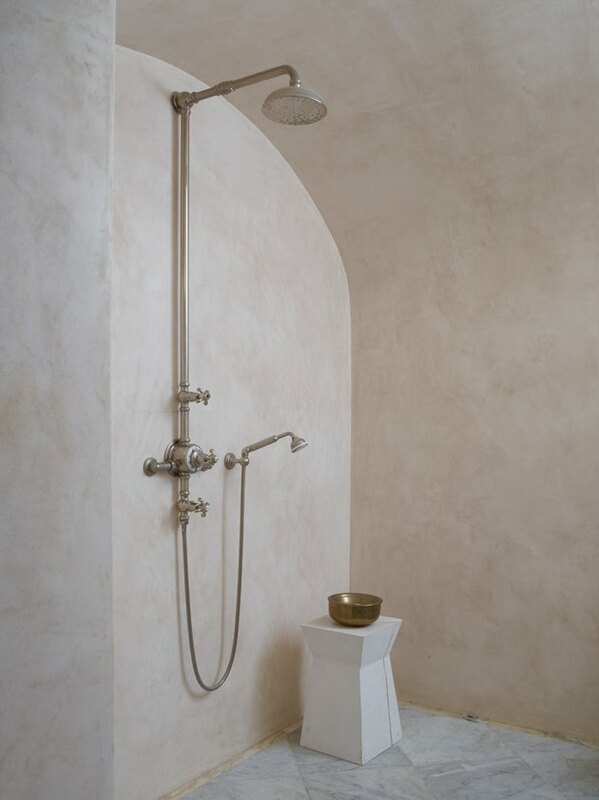 The pared-back approach makes it a calming space for getting clean. 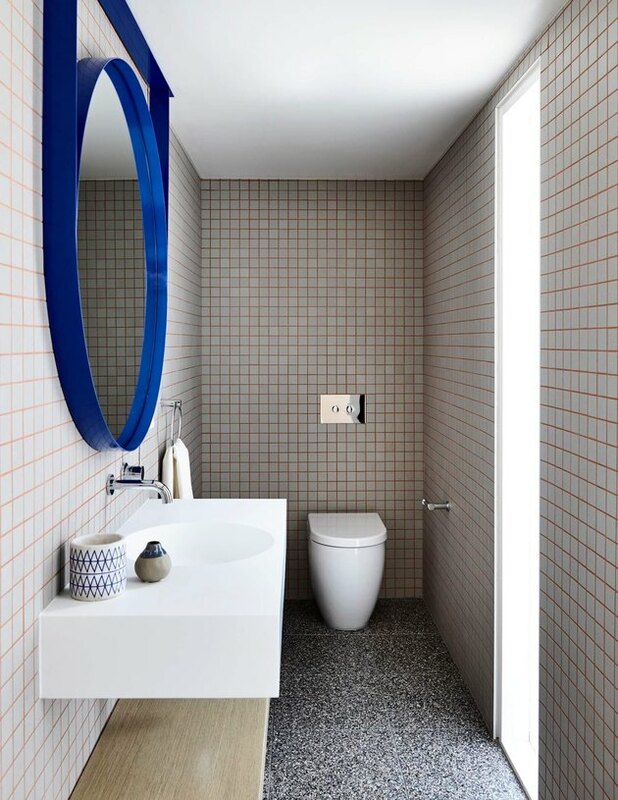 The rosy grout in this contemporary bathroom idea by Doherty Design Studio is right on trend with Pantone's color of the year "living coral," which was announced just a few days ago. The bespoke electric blue mirror completes the graphic nature of the the narrow space, adding a fun punch of color to the simple scheme. This modern gray bathroom in Australia goes all out to give starry-eyed a new meaning. 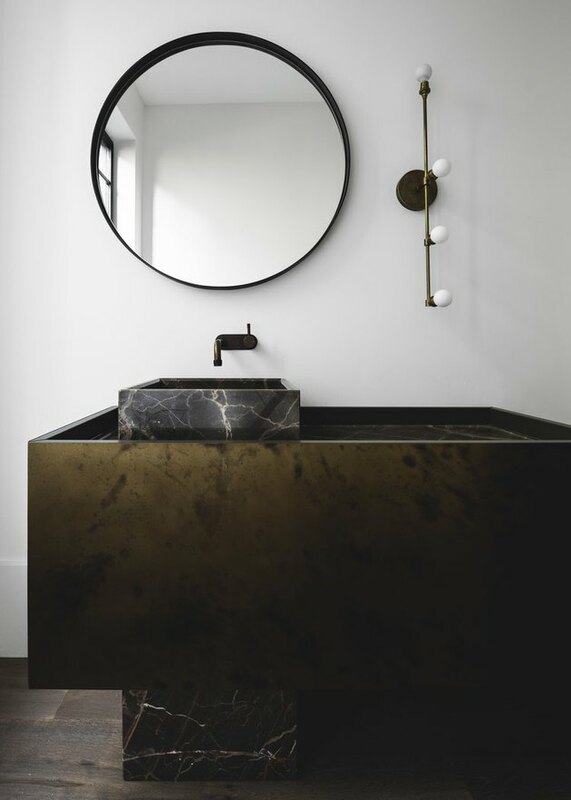 From the oversize round mirror to the floating vanity cabinet topped with marble to the sculptural bowl sink, there is just so much to love in this striking washroom. Hexagonal shaped tile works wonders in bathrooms to create a clean and contemporary look. 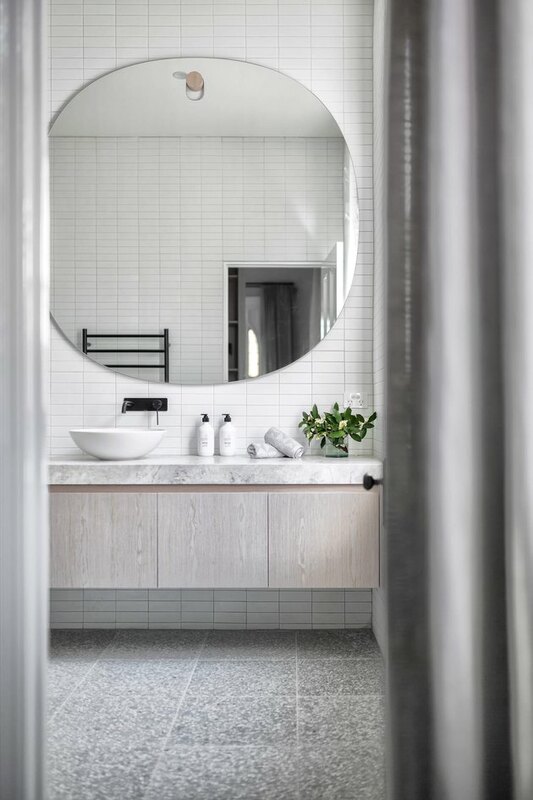 Pair them with black fixtures and black tile flooring, as shown in this creation by BKK Architects, for the perfect backdrop to your Aesop bottles. This contemporary bathroom idea designed by Arent&Pyke is taking things to the next level ... literally. 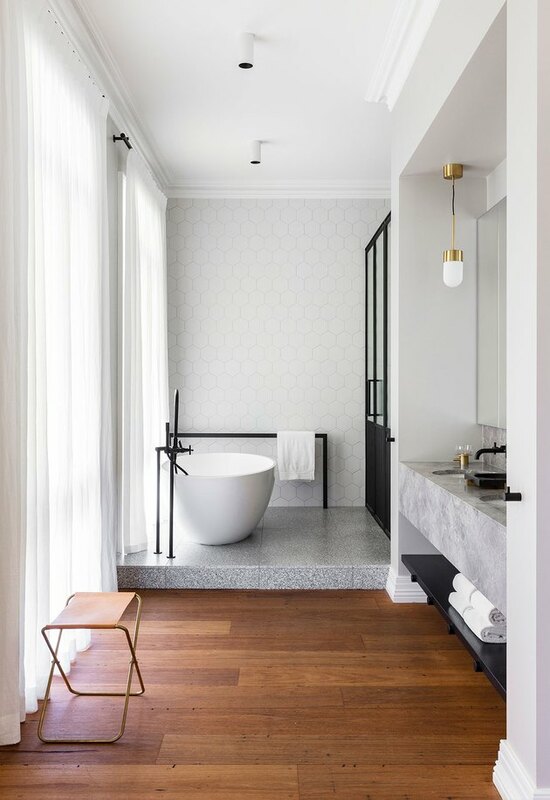 A raised platform separates the freestanding bathtub and shower area from the rest of the space, creating a dynamic design complemented by chic black accents. We can't stop staring at this stunning masculine creation designed by Handelsmann and Khaw. It's a contemporary update on industrial style using geometric forms with rich natural materials and textures to create a luxurious escape. Pump up the drama like Luke Fry did in this contemporary bathroom design, showcasing matte gray walls that sit above a dark tile wainscot. 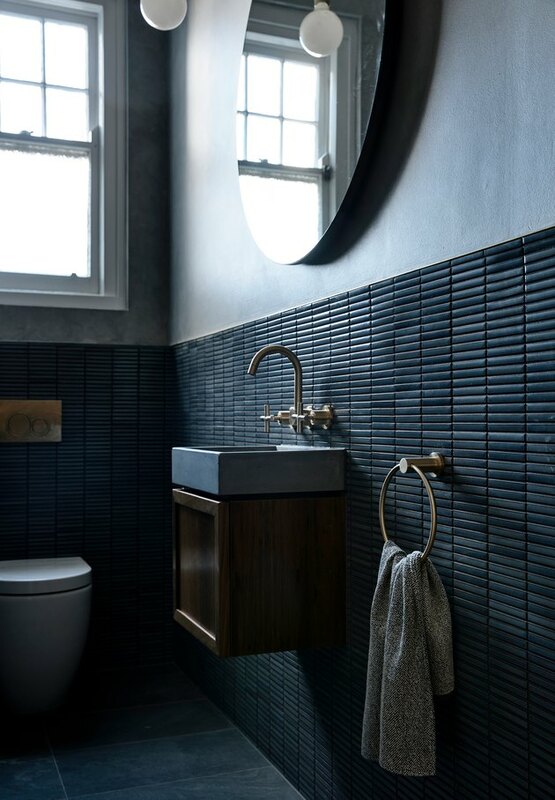 The tile-clad lower walls are accented with brass fixtures and a dark floating vanity cabinet topped by a concrete sink, resulting in a moody yet glamorous refuge. If you're looking to create a dramatic statement without breaking the bank, color blocking could be the way to go. 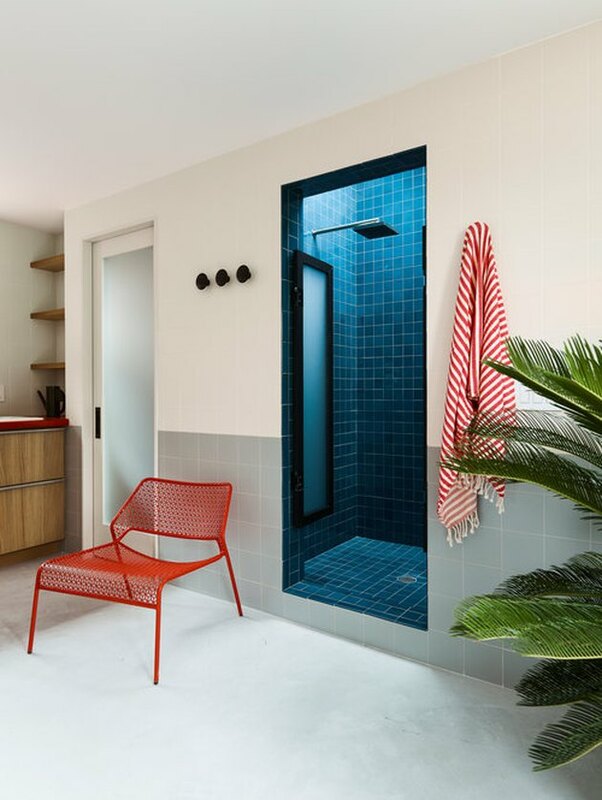 This modern beach-chic bathroom designed by General Assembly uses simple square tile in sea-foam green to create a subtle wainscot, while the alcove shower is covered in deep ocean-blue tile from floor to ceiling. 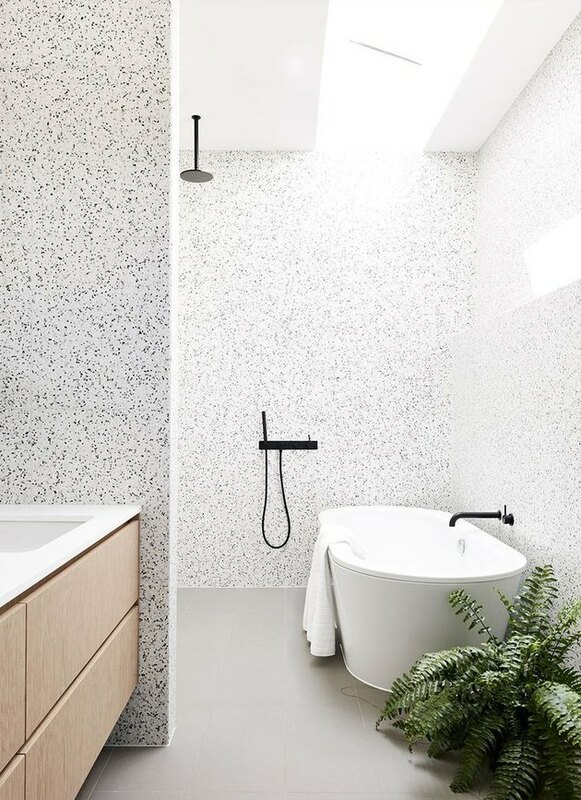 For fans of the more minimalist look, this terrazzo bathroom could be the answer to your bathroom prayers. Clean lines paired with simple black fixtures and an open walk-in shower make for a no fuss approach. 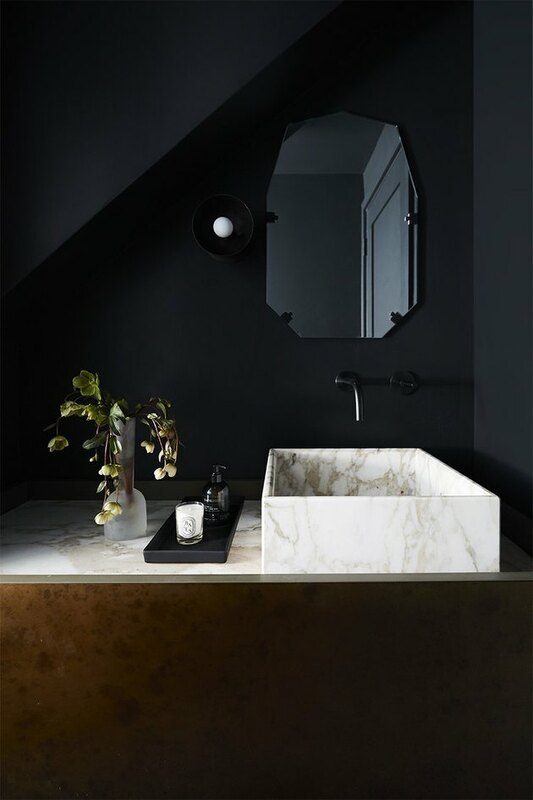 Take a walk on the dark side like the team over at Nune did with this black bathroom. 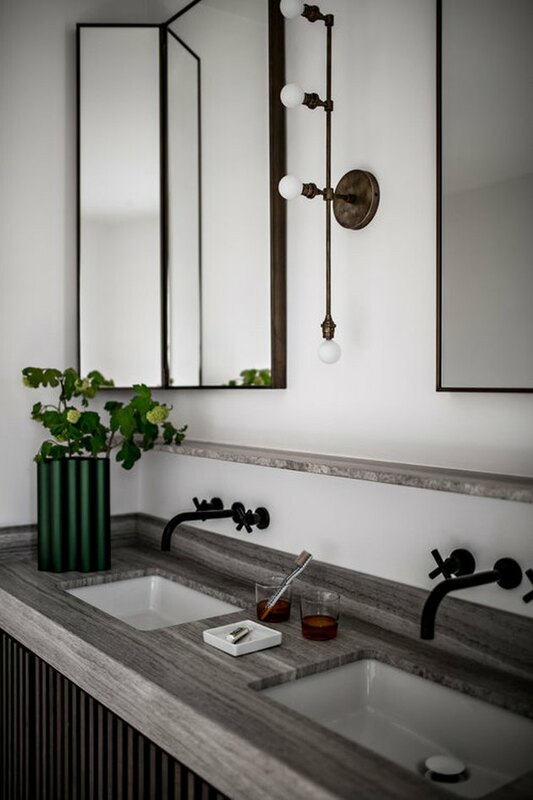 Take note of the warm vanity cabinet topped by an alluring marble vessel sink and matching countertop. Swoon. Insert heart eyes emoji here. This jaw-dropping contemporary bathroom idea designed by Decus is a marvel in pink. Who wouldn't want to wash the day away in that marble bathtub surround?